Six Sand Martins were at Sarsfield Lock in Limerick City (TT). The 3cy Kumlien’s Iceland Gull was at Harvey’s Quay (TT). A Chiffchaff was at Monaleen (TT). The 2nd winter Kumlien’s Iceland Gull and an adult Ring-billed Gull were at O’Callaghan’s Strand (TT). 62 Oystercatchers were at King’s Island (TT). 37 Whooper Swans were at Glascurram, Kildimo (Geoff Hunt). The Ring-necked Duck was at Westfields (Maura Turner & Geoff Hunt). The Kumlien’s Gull and an adult Ring-billed Gull were on the Shannon in Limerick City (GH). 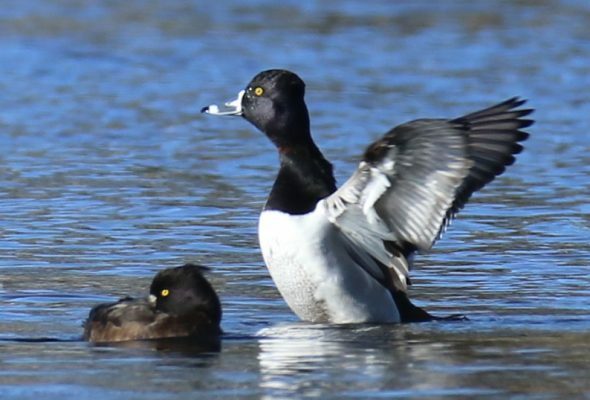 The Ring-necked Duck was at Westfields (Geoff Hunt). 37 Whooper Swans were at Athlacca (Geoff Hunt). A Blackcap was in song at Monaleen(TT). The Ring-necked Duck was at Westfields (Geoff Hunt and Jim Bowman). The 2nd winter Kumlien’s Gull was at Bishop’s Quay (JB). A male Ring-necked Duck was at Coonagh along with six Gadwall, nine Mallard, 12 Tufted Duck, 12 Pochard, 23 Coot, ten Little Grebes, four Mute Swans and three Grey Herons (Tom Tarpey). A Buzzard was at Tervoe, Mungret(TT). A Yellow-browed Warbler was found at Westfields this morning (Niall Keogh). This is a first record for Limerick. The male Ring-necked Duck was also present (NK, GH & TT & JNM). The 2nd winter Kumlien’s Iceland Gull was at Bishop’s Quay (TT). A Chiffchaff was in a garden in Limerick City (Perse Ryan).